1.Take desi ghee in heavy bottom pan. 2. Add grated beet root in the pan when ghee becomes hot. Roast it properly till its raw smell disappears. It takes about 3-4 minutes. 3. Grind coconut in mixer & then add in roasted beet root. 4.Mix well. Roast the mixture again for 5 minutes on low flame. Add gulkand & mix properly. Add cream. 5.Add sugar, dessicated coconut, elaichi powder & saffron threads. Preserve some dessicated coconut for decoration. 6. Mix it properly. Go on cooking till all the sugar dissolves. Add milk powder. Mix well. 7.The mixture started to turn like a ball leaving the sides of the pan. 8. Turn off the gas & transfer all the mixture on greased butter paper. 9. Cover it with another butter paper & spread the mixture evenly. 10. Sprinkle the dessicated coconut which is preserved for decoration.With the help of rolling pin make the surface of the mixture plain. 11. With pizza cutter or knife cut the burfi into the shape as you like. The colour of the burfi looks beautiful with beet root & its healthy too. The heavenly smell of gulkand makes it very delicious. Hello! I want to try this recipe. It sounds very interesting. I have a question though, you have mentioned cooked and grated beet root 1/2 cup. Does that mean I have to boil the beetroot and grate it? 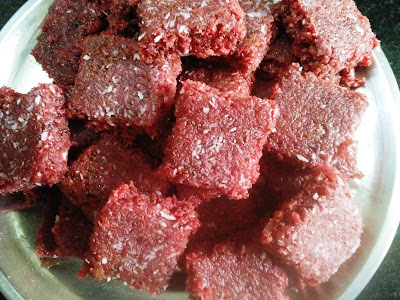 Or is it raw grated beetroot 1/2 cup which is then cooked in ghee as per recipe step 2?